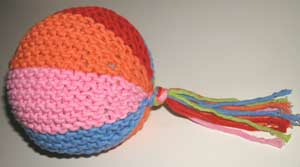 Babies love colorful balls they can easily grab onto - so why not knit one using colorful yarns in a great Garter Stitch texture. 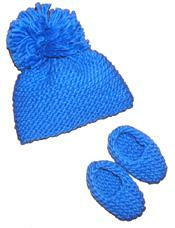 A wonderful handmade gift for any infant or toddler. Uses simple Garter Stitch and shortrowing for shaping. Instructions are written with NO abbreviations and are very easy to follow. Includes explicit instructions on how to do shortrowing, so no previous experience with this technique necessary! Knit on size 10-1/2 knitting needles.